In January, Cosmo and I moved from a 2,000-square foot house to a one-bedroom apartment, with plans of Phoebe joining us in a few months. The move was an adjustment for all of us. One of the biggest changes was the lack of windows in the new place. Our house had a multitude of windows, but the new loft only had two small ones with a large one positioned on top of them. Don't worry about trying to picture what I'm describing -- here's a photo. The "before" pic. No lookout perch for kitties. My kitties had no easy way of checking out the world beyond our walls, which is one of their favorite hobbies. And I couldn't find a cat tree that provided really high lookout perches that matched the height of my windows. Just to give you some reference, the bottom of the larger window is about 7.5 feet off the ground. 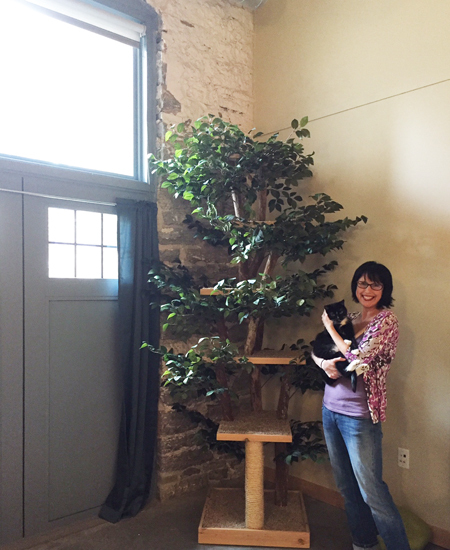 Thankfully, a fellow cat writer connected me to Pet Tree Houses, a Florida-based company that builds exactly what I needed. They took my window measurements and, in a few weeks, sent me a photo of what they'd created. I was blown away! It looked huge! I guess it needed to be if I wanted my cats to have a proper view. The cool thing about Pet Tree Houses is that they're made of all-natural materials. 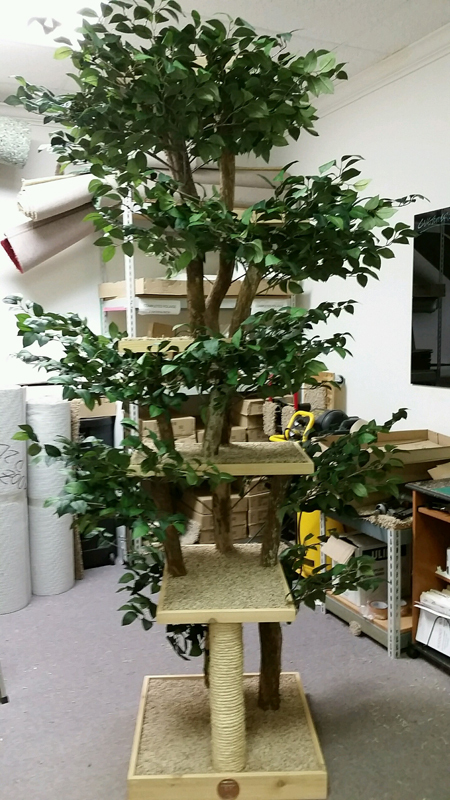 The perches are cedar and the carpet pieces are easily removable for cleaning or replacement. The leaves are silk, but the most unique part, to me, is the trunk. The trunk is a genuine tree trunk, and comes from a rare species of tree found in Georgia, Florida, and South Carolina. It's dense, durable, and flexible. Perfect! Newly unpacked components. Let's hear it for color-coding! The tree house's parts arrived in two large boxes. When I unpacked them, everything was carefully labeled and the instructions were easy-to-follow and concise. Assembly? Easy peasy! Thanks, Julia! 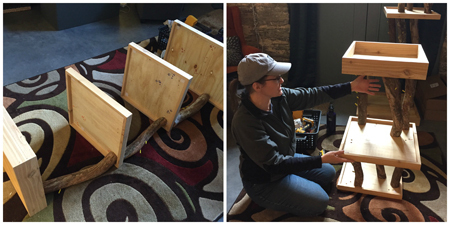 My friend Julia, an engineer, came over to help me assemble the tree house. She's an expert at assembling just about anything ... and I am not. She said she was expecting it might be quite the task, but after we dug in, admitted the directions were some of the best she'd ever seen. Everything was expertly labeled and color-coded. Heck, even I could have put it together alone. She followed up with a rave review about the overall quality of the tree. Inspector Cosmo's job is never done. Of course, Cosmo had to "help" with assembly -- or at least thoroughly inspect everything to make sure we we weren't making any mistakes. You know how we humans are. All told, it took us about two hours to assemble the tree house and only needed a few tools. A screwdriver is necessary, but I recommend a drill for quicker results. Also, your hand will thank you. Not really, but if it could talk, it'd say, "Thanks for using a drill!" 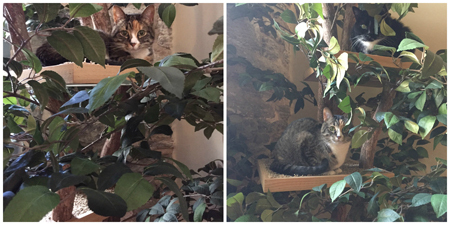 After we placed the tree house in the corner, it was clear the perches were at absolutely ideal levels for maximum kitty lookouts. I placed a cat bed on one of the perches. Phoebe approves. 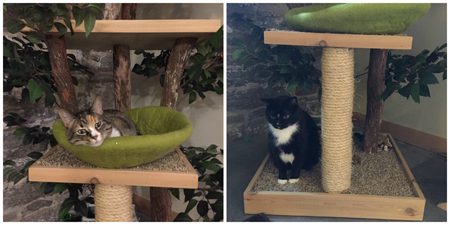 I was wondering how each of my cats would respond to the giant tree in the corner of the room. Of course I wanted them both to jump from perch to perch, spending hours looking outside, spying on humans and birdies. Can you see Cosmo on the right? he's up there! Well, my dream partially came true. Phoebe, my little adventurer was all over the place. She raced to the top, hung out on the middle perches, hid among the leaves, scratched like crazy on the rope, and was totally enthralled with the outside view. Cosmo? Well, he was another story. He only made it to the top when I placed him there ... and then he immediately looked for a way to the bottom. He loves the tree house, but is more of a ground dweller, and spends loads of time on the very bottom area, but does venture to the middle sections from time to time. While we put the tree house together, a small part of me worried it would look monstrous in my small space, but it really doesn't! It's such a pretty piece of furniture and blends in well with everything else in my living room. Plus it adds a much-needed splash of green to my space. Look how nicely it complements my living area! 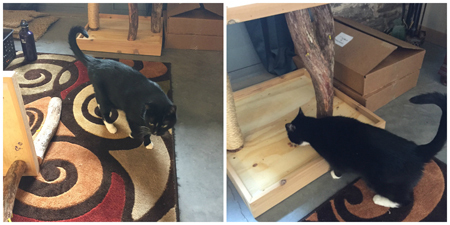 When you visit the Pet Tree Houses site, you'll notice they offer models of various sizes, so you don't have to choose one that's super tall. In fact, Pet Tree Houses is giving Catladyland readers a 10% discount on the purchase of a tree house. Use code CLL10 at checkout (offer expires 9/30/16). Deal! I'm incredibly pleased with my Pet Tree House. It's clear a lot of time, thought, and care were put into its design an construction. It's truly a work of art, and now my cats can be nosey neighbors! Pet Tree Houses provided a free tree for this review. Catladyland only shares information we think would be of interest to our readers. The opinions are our own.